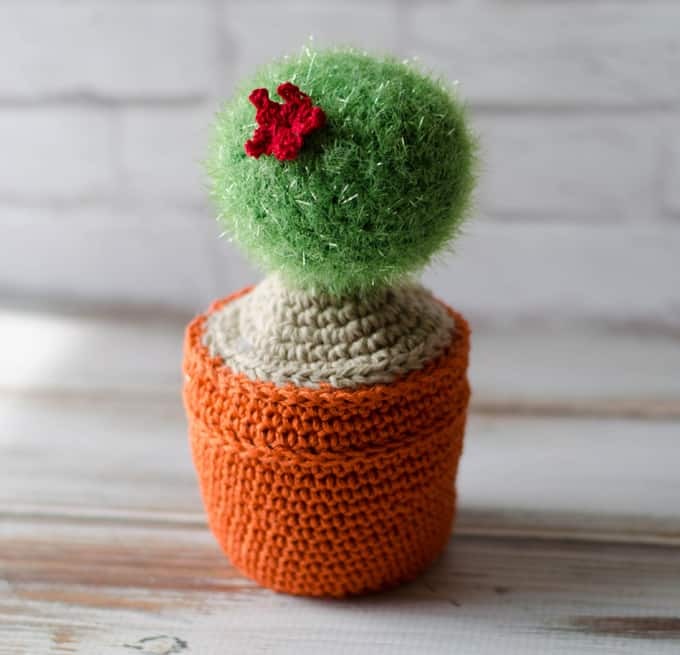 Isn’t this crochet cactus about the cutest thing ever? 6 inches of bright cheery goodness! And bonus.. I can’t kill it!When Global Backyard Industries offered to send me a couple of crochet cactus kits to try out in exchange for my honest review, I just couldn’t help myself. Our office is moving over the summer and I will finally have an office with a window. I think this crochet cactus will be perfect to display in my new space. No watering required! Global Backyard Industries has two adorable cactus kits: Ruby and Charley. Charley loves to snuggle and I was attracted to the cutie flower so I started with that one first. Ruby is a tall girl who loves hugs. So you can’t go wrong with either kit! The packaging and contents of these kits are top notch. The bag is designed to be re-sealed. So you can keep all your supplies right in the bag! 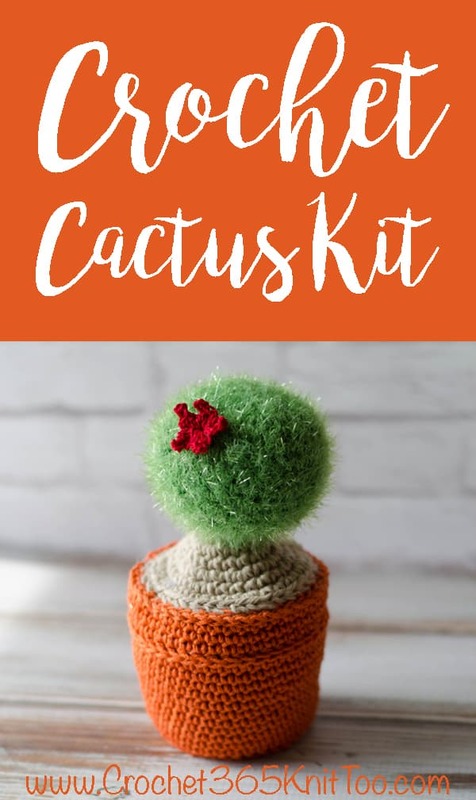 The kit includes everything you need–yarn, stuffing, crochet hook, darning needle plus all the little extras to put the cactus together including a pre-made red flower. The flower is out of thread, so rather than adding another size hook and increased difficulty, they decided to just go with the pre-made option. I was really impressed with the quality of the products in this kit. I’ve purchased a lot of crochet kits and the yarn is usually kind of ‘meh’. The yarn in this crochet cactus kit is very nice. The orange, terra cotta pot yarn is a nice quality cotton yarn, just like something you would find in your local yarn shop. The textured yarn is is the perfect shade of prickly cactus green. And there is plenty of it with quite a bit leftover. 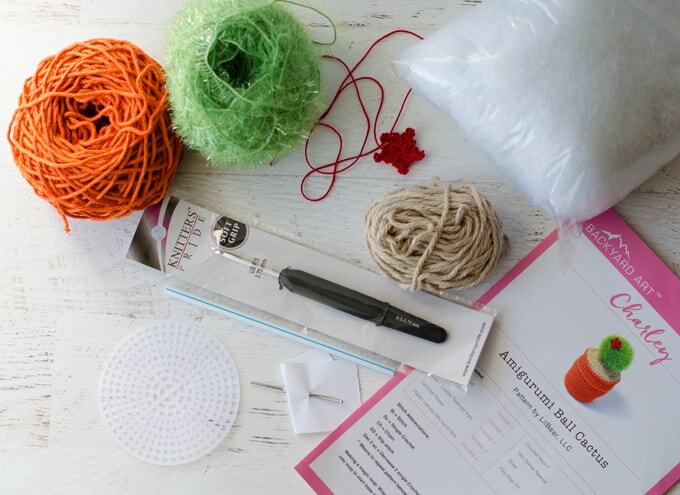 Every detail is included in the kit, even a high quality crochet hook. All you need is a pair of scissors and you are good to go! There is even a video tutorial link in the directions, if you prefer to learn that way. The stitch counts are not always provided after every row, but I just kept a post it note handy and jotted them down as I went along, so I wouldn’t forget. I really like how the ridge is worked on the pot. It reminds me of a real terra cotta pot. Such a nice touch. Finishing the cactus was so easy. There were good photos provided in the instructions and it came together nicely. Easy peasy. The crochet cactus kits are perfect for an office or for decorating your home. They would make a great gift or a nice gift for yourself too! It is so nice that everything is included and you can fell confident that you were giving a gift that a crocheter would really appreciate. Want to buy a kit? Head over to Global Backyard Industries or, if you prefer, you can pick the kits up on Amazon. Either cactus is a quick and fun project that can be finished in an evening! Remember that cutie little flower for Charley? The one that comes already made in the kit? Well… I explained to the kind folks at Global Backyard Industries that my readers are the industrious sort. What if they wanted to use the pattern again to make another cactus..and…alas..didn’t have the ready made flower. Chain 3, treble crochet, chain 4, slip stitch in top of treble, chain 3, slip stitch into magic loop. Repeat 4 times making 5 petals. Tighten and close opening in magic loop. Fasten off leaving 24” tail to attach to cactus. Weave in loose ends. 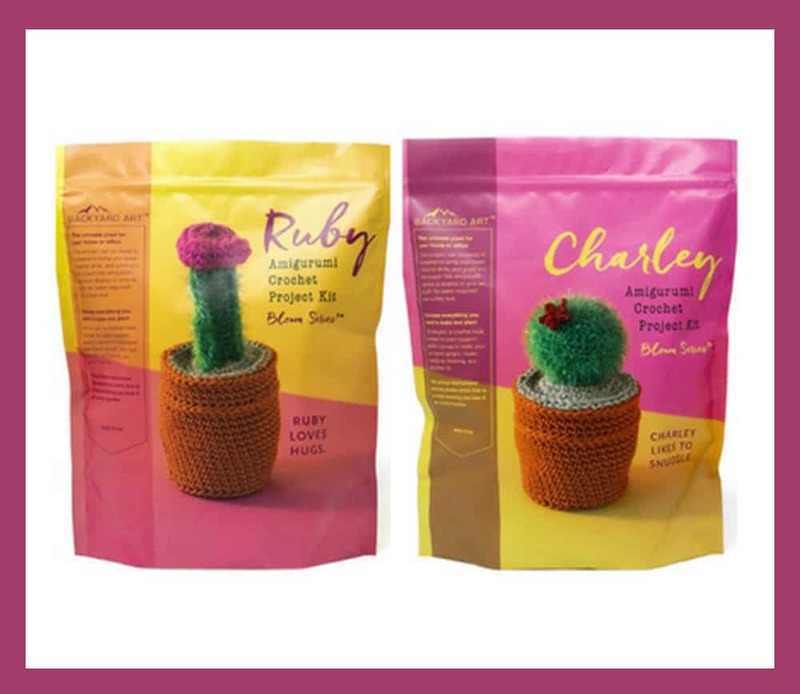 Do you love the Crochet Cactus Kits as much as I do? I love seeing your finished projects! If you make one of the cactus kits, I’d love to see yours on Instagram, be sure to tag me @crochet365knittoo. If you are on Facebook, stop over to the Crochet 365 Knit Too Facebook page and share a photo! I’d love to see your work! Thank you to Global Backyard Industries for providing the adorable Crochet Cactus Kits!